Journalist and author Christine Keneally is the only non-fiction author to make it onto the shortlist of Australia’s prestigious The Stella Prize for women writers announced today. Her The Invisible History of the Human Race looks at the role of DNA in shaping us, and our world. 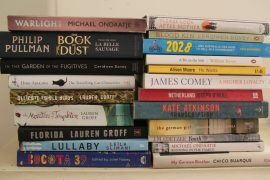 In announcing the shortlist, Stella Prize executive director Aviva Tuffield said: “These six remarkable books explore themes of identity, family, displacement and belonging, with distinctly Australian resonances.’’ The winner will be announced on Tuesday 21 April. Previous recipients of the prize are Carrie Tiffany’s Mateship with Birds (2013) and Clare Wright for The Forgotten Rebels of Eureka (2014). Below is the Stella Award’s synopsis of each of the finalists. Maxine Beneba Clarke is a performance poet, acutely aware of the accents, idioms and cadences of the spoken word, and her gift with voices – their origins, their meanings, their struggles and triumphs with alien English – is at the heart of this collection of stories. All ten stories deal with displacement in some form, and some of that displacement has been violent: there are stories of racial conflict in Brixton, of asylum seekers in flight from the Tamil Tigers, of psychological and physical violence between a naïve white-Australian wife in a strange land and her twice-displaced African husband. Although these are stories about inequalities of power in the intersections of class and race, Beneba Clarke also uses narrative voices and the effects of dialogue to show characters attempting to create and assert a coherent self through the power of speech. Her work is profoundly political, but it is also more than that. Lily is an only child, and when she befriends the exotic Eva – daughter of artists and ‘old money’ – at school, it’s the beginning of the kind of love affair that solitary children often have with large exuberant families. But this is bohemian Melbourne in the 1930s, and in many ways it’s not a good place for any child to be. As the girls grow up their world gets darker and more complex, eventually imploding into scandal. While it’s partly inspired by the real-life 1930s artists’ colony at Heide in Melbourne, this novel’s characters and plot are wholly fictional and the result is a satisfyingly cohesive vision and story. With its reflective tone, rhythmic style, and vivid scenes, Bitto’s novel illuminates the history of a particular time, place and way of living, but it also draws out the more abstract themes, common to all times and places, of friendship, memory, ambition, and family life. The sciences and the humanities are traditionally thought of as separate, or even as opposite, fields of study and endeavour, but Christine Kenneally moves on from this kind of thinking in her fascinating exploration of DNA and what it tells us about our individual, social, and anthropological pasts, bringing genetics and history together via the concepts of ancestry and inheritance. At every stage of this book, the data, the facts and the ideas are illustrated and enlivened by personal stories of individual lives and discoveries. Kenneally uses the contemporary enthusiasm for genealogy and family history as an accessible entry point for the general reader, giving us a wonderful assortment of insights into the meaning and value of the past. To read this book is to be in the company of a dynamic, ardent mind, talking in a friendly authorial voice and never talking down. Jimmy Flick isn’t an ordinary child, and as his story progresses we quickly realise that he has some unspecified condition, probably somewhere on the autism spectrum. He can’t slow down, he can’t calm down, and he can’t respond appropriately in difficult or even dangerous situations, but his world view is unique and full of unexpected insights. His father, defeated by the difficulties of living with such a child, takes to drink and domestic violence. And then things get worse. Sofie Laguna faultlessly maintains the storytelling voice of Jimmy, who is oblivious in some ways and hauntingly knowing and observant in others. There are many places in which such a story could tip over into sentimentality or melodrama, but Laguna’s authorial control and intelligence keep the story on track and the reader engaged and empathetic, and she manages both the humour and the darkness of this story with great sensitivity and control. The time is the early 1950s, the place Perth. The Gold family, survivors and refugees from wartime Europe, have been blasted by the fates once more: their only child, Frank, has been caught up in the polio epidemic and is now recovering in a halfway house for convalescent children, a converted pub called The Golden Age. Through the Gold family and their various acquaintances, London explores the social and emotional implications of her story with quiet power and precision, using the tale of one family at one moment in the social history of Australia to illustrate more abstract and general themes. It’s a story of exile, transition, and resilience; it shows the power of vocation and the fragility of love. And in its account of how it feels to belong to a displaced, marginalised and vulnerable race recently threatened with genocide, it has some delicate reverberations for the oldest Australians as well as for the newest.. This unusually structured collection of stories is divided into three sections, each named for some elemental quality in nature: Heat, Water, Light. They are environmental metaphors that serve as rich touchstones for the layered meanings of individual stories. ‘Heat’ is a sequence of closely interlinked family stories; ‘Water’, a futuristic novella, is kind of ecological speculative fiction and a very unusual love story; ‘Light’ is a collection of stand-alone stories, though certain themes and subjects recur here as they do throughout the book. Van Neerven moves with ease between realism and fantasy, using elements of myth and mysticism in her storytelling. From one story to the next, the content is always rich and suggestive and the writing is always beautiful and clever. Each of these stories is told with passion and conviction; van Neerven writes with the confidence, maturity, and subtlety of someone twice her age, and with startling originality.